Alise Cayen (center), the coordinator of the Reseda High School’s Police Academy Magnet School with two distinguished graduates – Hector Logos, a Los Angeles County Deputy Sheriff and Cesar Corrales, one of the first graduates who today serves with the LAPD. Cesar Corrales was one of the first graduates of Reseda High School’s Police Academy Magnet School, which is run by the nation’s second largest public school system – The Los Angeles County Unified School District. Today he serves proudly as a member of the Los Angeles Police Department. “The Magnet School had very high expectations of its students,” Cesar said. “And that kept me on track. I learned discipline in that program and that helped me become a better person.” Cesar’s high school friend Alex Martinez, also graduated from the Reseda’s Police Academy Magnet school. He went on to become an MP for the U.S. Marine Corps before joining the Department of Defense as a Military police officer. At Reseda High School in California, we have incorporated the Police Academy Magnet school into our educational program since 1998. Our mission is to prepare interested students for law enforcement careers. It is one of four high schools and two middle schools within the LA County School District to have a Police Academy Magnet school. Alex Martinez graduated from the Reseda High School Police Academy Magnet School and went on to become an MP for the U.S. Marine Corps. LAPD Officer Brian Carver is another graduate. Brian says the program especially benefits students who are interested in law enforcement, but unsure of pursuing a law enforcement career. * Brian Carver’s another graduate. 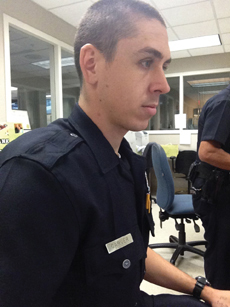 Officer Carver Joined the LAPD in 2014 and believes the program especially benefits students who are interested in law enforcement, but unsure of pursuing a law enforcement career. “Through building leadership skills, weekly inspections, guest speakers, and physical training exercises, the Police Academy Magnet school inspires its students to pursue a career in policing. Before joining Reseda’s Police Magnet School, Greg Carlson was struggling academically and running with the wrong crowd. Alise Cayen is the coordinator of Reseda High School’s Police Academy Magnet school.